Project Name should be the same as your original project name. Create from Template, instead of spending time on choosing a test framework. You can pick from Testinium’s predefined up-to-date project templates. If it is enabled, you will be requested to enter a project URL to test. Test File Type; Testinium supports many languages and libraries including; Java, HTML, CS, CUCUMBER, GAUGE, SPECFLOW. Test Runner Tool is based on test file type and it dynamically changes. GIT Project Folder Name; you are advised to set this name same as your project name. 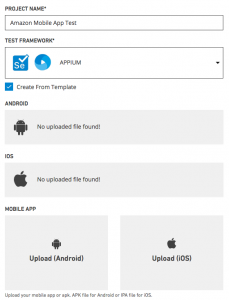 *Since Appium is a mobile test framework you should choose an operating system and upload. IPA or APK file, as well. Create from template option also offers a sample project to save you time and enable you to get hands-on with your project as soon as you can.